10% Off Tickets to Whipsnade Zoo at AttractionTix - Great for Easter Weekend! The View From the Shard is not only an amazing way to soak in the energy and vibrancy of London from above. With its bar and restaurants, The View From The Shard is also a nightlife experience like no other. Take advantage of dinner deals, or take in the view twice with the Day & Night Experience, which allows you to see beautiful daytime views followed by electrifying vistas of the city at night. As well as being one of London’s premier tourist attractions, The View From The Shard offers evening and educational events that you won’t find elsewhere. Discover the history of the River Thames at Objects in Focus on the last Sunday of the month, in which the Museum of London brings artifacts to see and touch. Or if you want to experience yoga up amongst the clouds, book a ticket with Sky High Yoga and enjoy top-quality yoga instruction plus the chance to savour the view after the class. How do I use my The View From The Shard discount? View the discounts available and follow the link the website of The View From The Shard. Choose your date, time and ticket type and then click ‘Pay By Card’. Enter your name, email address and postal address. You will then need to enter your payment details to confirm your booking. Your vouchercloud discount will be automatically added to your purchase. 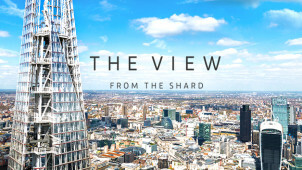 For the latest news from The View From the Shard, sign up to the newsletter. What’s included inThe View From The Shard ticket prices? For a full list of what’s included in ticket prices, please see the Tickets section of the FAQs page. Does The View From The Shard offer student discounts? Yes - you will be required to bring full student ID. Does The View From The Shard offer Gift Cards? Yes. You can find out more here. For ticket bookings, please call 0844 499 7111 or use this online contact form. Tickets cannot be refunded. However, if you’re unable to attend your initial booking, tickets can be changed for a later date. The View From The Shard is usually open between 10 am and 10 pm in summer and between 10 am and 7pm on some days in winter. For a full list of opening times. See here. Situated in the heart of London, and offering stunning panoramic 360 degree views of the capital, The View from the Shard is a unique visitor experience that will entirely change your perspective of the UK’s biggest city. The View From The Shard vouchers, offered by vouchercloud, will offer you a reduced entry price to one of the most iconic landmarks on the London skyline, which also happens to be the tallest building in Europe. The Shard was designed by architect Renzo Piano and its construction was completed in 2012. Standing at 309.6 metres, or 1,016 ft tall, the Shard has 87 levels and 306 flights of stairs. From the 69th floor of the building, you’ll be able to see for up to 40 miles across London, and from the viewing platform on level 72, you’ll be able to stand in the open air and experience the city as you never have before. For a truly special way to experience the Shard, why not treat yourself and a loved one to the Champagne Experience? Enjoy the spectacular view from the gallery while savouring a glass of Champagne Lanson, and learn about the city skyline from knowledgeable guest ambassadors. The View From The Shard discount code allows you access to decadent treats like this, where you can also deepen your knowledge of the capital through free audio visual guides in several languages.